In last month’s community poll we got you thinking about tyres, we specifically how often you check them. A lot of you got in touch with us on this and 70% did agree that it’s good practice to check your caravan or motorhome tyres before every journey. So what checks are needed and how often? It’s recommended that both the tyre pressure and wheel nuts should be checked every time you travel – and most of you seem to agree with this. 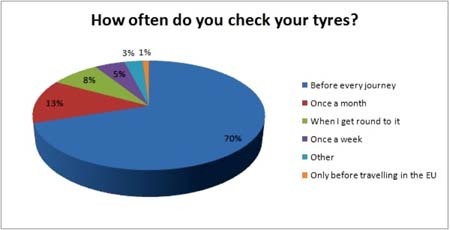 Even though the majority of you agreed with these comments, 13% of voters told us they check their tyres just once a month; 8% admitted to checking tyres only ‘when I get round to it’ and 5% check tyres once a week. 1% of you only check tyres before travelling around Europe. A few of you suggested ways to make tyres checks a little easier and journeys safer; Brian Lewis uses a Tyre Pal system on his motorhome to monitor his tyres on every journey. Meanwhile Andrew Taylor recommends using an infrared thermometer that checks all your tyres (six or eight on motorhomes) in just 30 seconds – check out Amazon, Maplin or eBay for the best deals. Download your motorhome pre journey checklist for more helpful tips. Mr Lomas – a HGV and coach driver – believes that anyone towing should have to fill in a check sheet similar to those required of HGV drivers to avoid blowouts, while John Robbins checks his tyre pressure every 3-4 weeks when his caravan is in storage – great tip! Some really helpful tips here! Our latest Community Poll asks whether reversing cameras for cameras or motorhomes are an essential investment – cast your vote now! Can Tyron bands be fitted to Motor Home tyres, if so, is it a good idea? Had blow out in Italy last year, fortunately only doing 20mph on a very narrow steep hill and managed to safely come to a halt on the side of the road, hate to imagine what would have happened on the motor way. Yes they can be fitted to motorhome tyres. Further info can be found on the Tyron bands website. I feel it is important to check car and caravan tyres, pressures and condition, often and I believe Tyron bands should be a must for every one! i allways check my tyres on our motorhome as part of our pre travel checks,this year we went to italy and in the south the roads are very bad so i checked every day.if you are holidaying there this year i would recomend you do that. No matter how often you check tyres you can still have tyre failures. On a journey from France I checked my tyres at a motorway services, including feeling the the treads etc for any foreign bodies, pressure etc. 7 miles later at 60mph the offside tyre deflated suddenly. Fortunately it collapsed into the well of the wheel & I was able to safely move to the hard shoulder. The tyres were 18 mth old and subsequent examination by an expert couldnt find a reason for the failure. I fitted Tyron Bands to the van as I felt that getting away with no damage to the Van once wouldn’t happen on a second event. tyre pressures on motorhomes sould be checked literally before each trip.I spend a lot of time in France and Spain and enthusiastically check my tyres before I move.Tyres are paramount and must be taken more seriously.I am a retired poice officer and I have seen the result of under inflated tyres especially on motorways.If you pick up a nail or screw,if the nail stays in the tyre,the tyre will go down slowly.If it is thrown out it will go down,so it is better if the tyre goes down.So if you dont check your tyres regularly,you wont know if you have a soft tyre.Also use two gauges,check it a second time with a different gauge just to make sure. As an HGV driver I’m used to checking tyres every time I walk past them, I’m always looking for tyre damage & signs of pressure loss. My caravan & trailer tyres are always checked regularly, I always check them for pressure before using the van & when it’s parked up for the winter I sit the axle on RSJ sections to just keep the weight off the suspension units & therefore the tyres. The trailer doesn’t get the same treatment though. When we leave home or site with the van or trailer & always stop just before joining the mororway to walk round the vehicle & make sure the tyres or hubs aren’t getting hot. I do this again if we stop during the journey. Everything is serviced once a year but I don’t take chances. When I’m overtaken on the road by vehicles towing small trailers I often wonder if the owner ever bothers to thnik how hard the little suspension units work when they’re flying along the road & sometimes the poor trailer tyres actually leave the road surface. I bet not many of them get a second thought as long as they’re always there to be loaded when required. Whether alloy wheels are better for running temperatures of tyres or not I don’t know but I’m pleased to have them now so we can fit the Al-Ko lock which I think is superb. I’m also a big fan of Tyron Bands, since 1994 we’ve had three punctures one of which was at motorway speed & the outfit remained easily under control so I could bring it to a stop. I’m happy to believe this was aided by the Tyron bands. We agree Colin, Tryon Bands are very useful. We talked about them a lot earlier this year – take a look. The results from a recent poll we ran suggest that we need to spread the word though!